This numerical tour explores multifractal signal and texture synthesis. This tour is written by Pierre Chainais and Gabriel Peyré. The processes we deal with belong to the family of Infinitely Divisible Cascades (IDC). Only the simulation of the subfamily of Compound Poisson Cascades (CPC) is really simple to implement in 1D, 2D or even ND. Indeed, the synthesis of CPC can be understood as the product of a random number of indicator function of balls (of a 1D segment or a 2D ball) with randomized radius and randomized amplitude. If the distribution of the amplitudes and radii is well chosen, this leads to the synthesis of a function that is the density of a positive scale invariant measure. More precisely, this measure is multifractal. 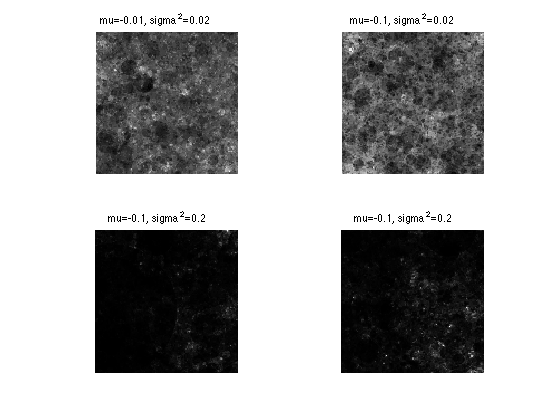 To obtain the final measure signal/image, the simulated measure density is integrated or pseudo-integrated thanks to some scale invariant low-pass filtering in the Fourier domain. Infinitely divisible cascades to model the statistics of natural images, P. Chainais, IEEE Trans. on Pattern Analysis and Machine Intelligence, Vol. 29 no 12, Dec. 2007. Visit the homepage of Pierre Chainais for additional information and softwares. 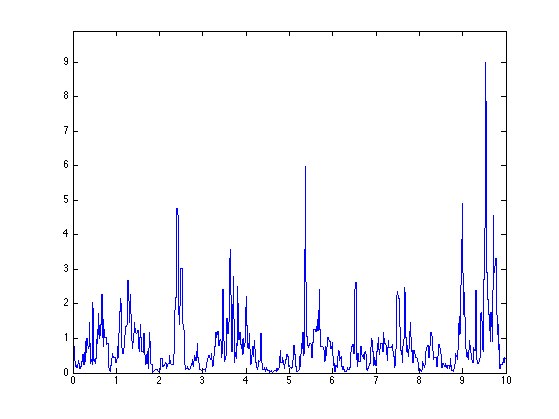 We consider here the synthesis of 1D signals using multiplicative compound Poisson cascades (CPC). Resolution of the cascade (the smallest scale at which details will be added). 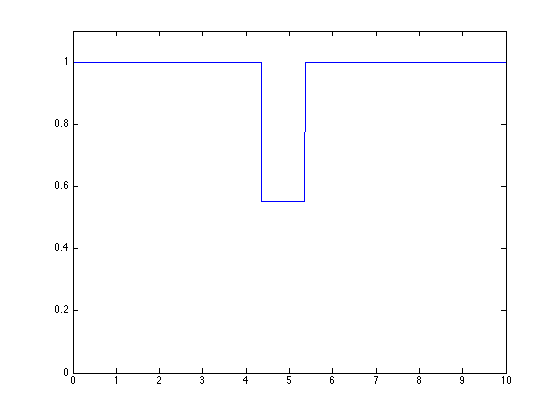 Sampling period of the simulation. Number of points. 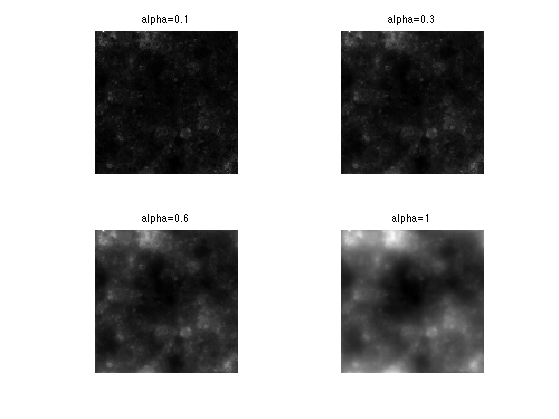 lambda = (1/rmin-1)*(T+1); % to ensure scale invariance, scales are distributed as 1/r^2. Time positions of the Poisson point process in the time/scale plane are uniformly distributed to ensure stationarity. Side effects are avoided by extending the cascade to [-1/2, 0] and [T T+1/2]. Scales ri of the points. Should be distributed according to dr/r^2, to have scale invariance. 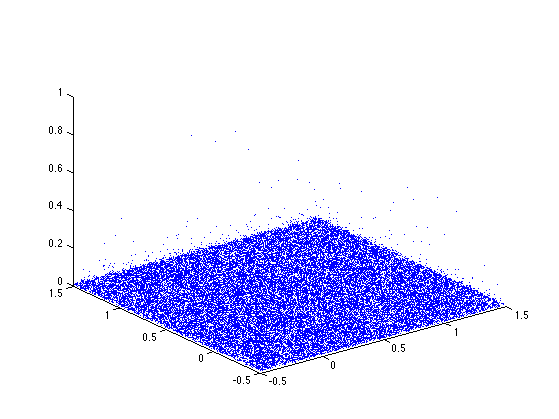 Display the Poisson point process in the scale-space plane. Parameters for the law of multipliers Wi (Wi>0). Here we choose a log-normal law. Another simple possible choice is to set Wi=2/3 for all the Wi. 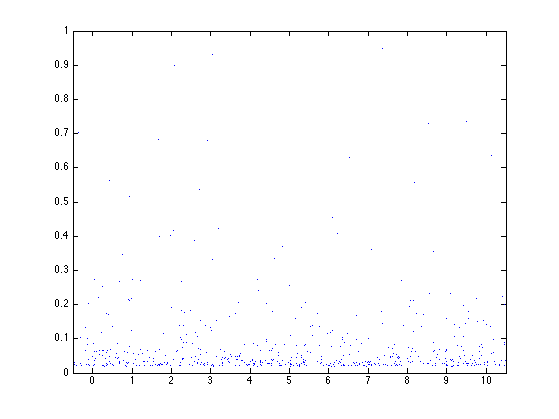 N = length(ti);   % the number of multipliers = number of time-scale points. Initialize the signal and normalize the measure. We show here the first step of the multiplicative cascade: iterations are on the multipliers (ti,ri,Wi). Select the points in the cone of influence of (ti(1),ri(1)). Perform the multiplication with the random multiplier. Exercice 1: (check the solution) Perform the cascade. Display intermediate steps. Exercice 2: (check the solution) Compute several realization for the same log-normal parameters. 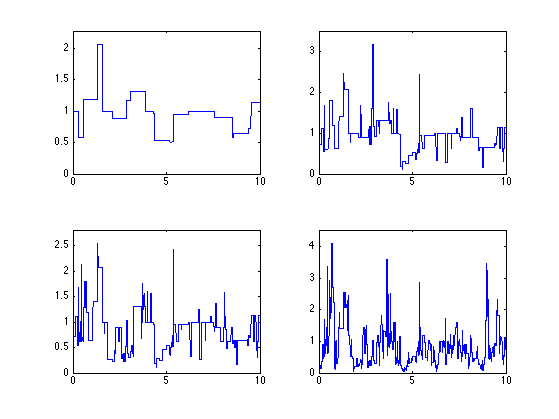 Exercice 3: (check the solution) Compute realizations for different log-normal parameters mu and sigma2. Use the same distribution of points. To generate 2D cascade, one needs to throw points on a 3D scale space domain. Minimum scale, should be roughly 1/n. Number of points in the cascade. N = round(lambda); % should be a Poisson r.v. with expectation lambda. Scale of the points. Should be distributed according to 1/height^3, to have scaling invariance. Display the points in the scale-space plane. Parameters for the log-normal law. Position in the X/Y plane. We enlarge the square in order to be able to use periodic boundary conditons. Initialization and normalization of the image. We give here the example of the first mutiplication. 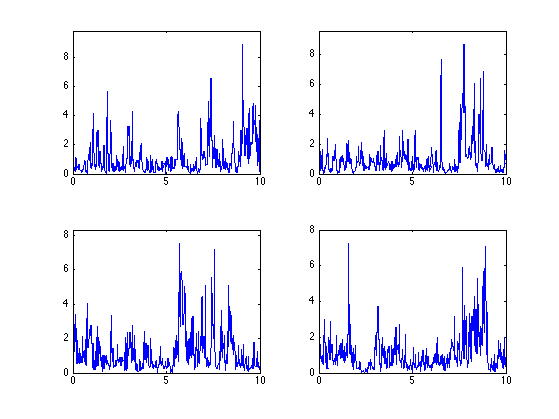 Localization of the signal locations that are influenced by the scale/space point indexed by (xi(1),yi(1),ri(1)). This corresponds to the intersection of the image plane and a cone of influence. 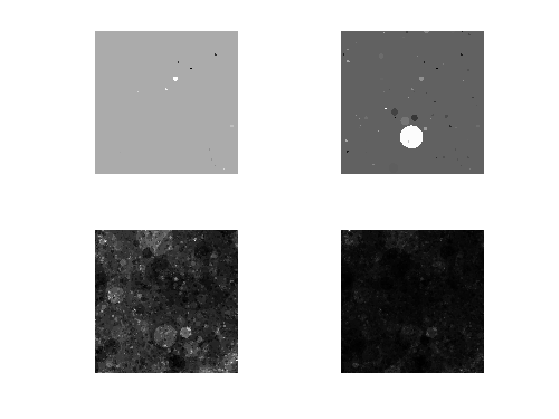 Multiplication of the image with the random multiplier. Exercice 4: (check the solution) Perform the full cascade, display intermediate steps. Display the image. It corresponds to a 2D multi-fractal measure. 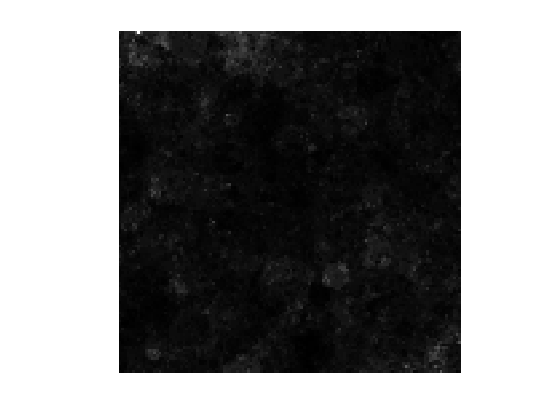 To compute the final texture, we perform a spectral integration, which corresponds to a low pass filtering. Exercice 5: (check the solution) Compute the fractional integration for several values of alpha. 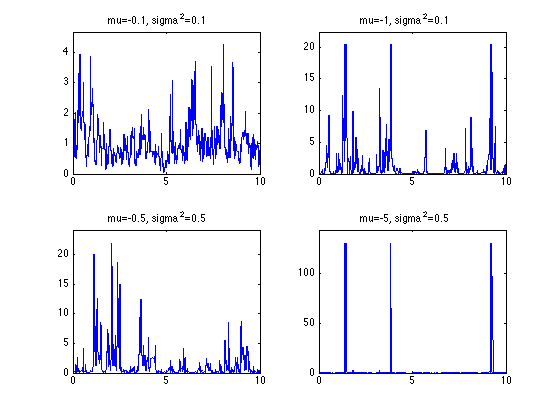 Exercice 6: (check the solution) Perform the cascade for several log-normal parameters mu and sigma2.